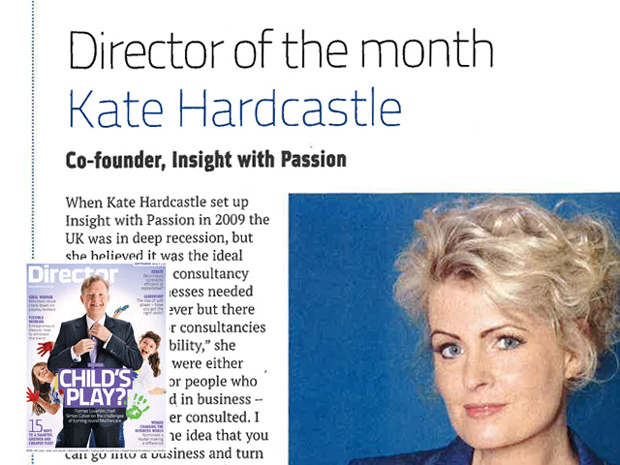 Our Founding Partner Kate Hardcastle is featured in this month’s Director Magazine. Four years on and Insight with Passion is flourishing. The company has grown year-on-year, runs offices in Leeds and Manchester with a satellite base in London, and employs 10 full-time staff as well as 30 consultants. But, admits Hardcastle, the last few years haven’t been without challenges. Who? [Dame] Anita Roddick. I wouldn’t be doing what I’m doing if it wasn’t for her. I wrote to her when I was a teenager and she met me and gave me nearly an hour of her time. She was honest and offered encouragement. Book The Tipping Point by Malcolm Gladwell. It’s fact-based and has lots of useful examples and case studies. Saying Two ears and one mouth – use them in that order. My nan always used to say that to me. Brand Disney and Innocent. Disney has magical value. Innocent was co-founded by another guy from Huddersfield [Richard Reed], like me. They’re always true to their brand. Favourite place Yorkshire. I like to spend time in the place I’m from. Can’t live without Music and any device that plays it. I listen to music all the time – I love it. The piece comes as IWP’s impressive speaking programme continues as Kate will be speaking at the Institute of Directors Women as Leaders Conference at the Grange Hotel St Paul’s. She is one of many successful entrepreneurs who will share stories, tips and advice on 15 November. Now in its seventh year, this engaging and popular event provides you with an opportunity to network with your peers and hear from the very women who are stimulating, revitalising and growing business worldwide. Whether you are at the top of your game,climbing the corporate ladder, or want to better understand the benefits diversity can bring to your company, make this event a date in your diary. Despite the progress made in the last century, the percentage of female directors on boards is still low. At this conference you can hear from and question the women who have made it to the top of some of the biggest international brands. These women business leaders have traits that other aspirational business women would be wise to emulate. Find out what motivates them and how they overcame the barriers they faced in order to achieve success. The subject of women on boards and in business continues to populate the column inches of papers and magazines even more significantly these last twelve months; it remains highly topical. Having become a multi award winning business woman, saving the fortunes of many businesses and creating multimillion £ value brands, before establishing her own business – Insight with Passion. Kate has spoken on world stages on her specialist topics of Business, Brand, Marketing & Customer Focus. The Keynote speeches are sell out, & Kate speaks alongside names such as Bill Clinton, Joanna Lumley & Michael Jordan to name a varied few. Insight with Passion has been tremendously successful as a business, in the 4 years since launch – helped by Kate’s rising media profile. Kate is the go-to expert for the BBC, ITV, ITN, SKY, CH4 & 5 on her areas of expertise in retail, business & turnaround.